With these tags, I am not questioned for certifications anymore even though I carry it with me always. Rocky likes his tag too!! Normally, I strongly dislike writing reviews, but these tags sure deserve recognition!! I was skeptical about how the pictures would look from sending them over the internet, but they made these "Service Dog Identification" look as professional as any ID I have ever seen!!! The service was extremely fast, professional, easy to follow instructions and a pleasure to deal with. The site is very thorough also. The dogs love the tags, and they don't seem to bother them during normal or strenuous activities either. Rocky even licks his once in a while and they do not fade, nor do the inks run. The wallet cards are the same size as credit cards and fit into protective silver credit card pouches also. You cannot go wrong with these cards!! They supply you with plenty of copies too. I recommend this service to all that have need of service animal representation in the public!! Thank you oh so much. I have ordered from this company more than once & have been satisfied with the product they produce. I have referred other people to them. The service and the products were "First Class"
I'm getting ready to place another order. 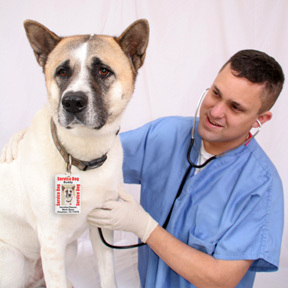 We prurchased the same tags two years ago and have made sure our service dogs wear tags. These tags are helpful in distingiushing our service dogs from pets on public transportation and at local businesses. I would like for them to be a little tougher Sugarfoot plays hard and has snapped the tag at the ring. Our other service dog chews her tags and I will be ordering more soon. I also like that there is a large card printed up to carry in your wallet. We have moved since our first order so our zip code changed so it was time for new tags anyway. I also like that our phone number was added to the tag in case our dogs would wander off, not much chance of that but it doesn't hurt to be prepared. The lady helped me decide which tags to order. She was patient and kind. This is the first time I have ordered tags and I needed them for an airplane trip. Also, I have found out that when I go other places there is no questions about the "dog" and why I have her with me. You can't go wrong with using this company. Oh, also I received them in a short time 3-4 days! Fantastic product. Very helpful staff . I want to spread the word! This is a great company. Very professional! I recently purchased a set Service Dog Tags and am so pleased with the quality and professional appearance. The picture turned out wonderful. I've had many compliments on this tag and handed out the information for others to order for themselves.